If you haven’t already, now is a good time to stop and configure logging to disk on your MikroTik router. What we have done here is defined a new logging action named auth that logs to a file on disk named auth.log. 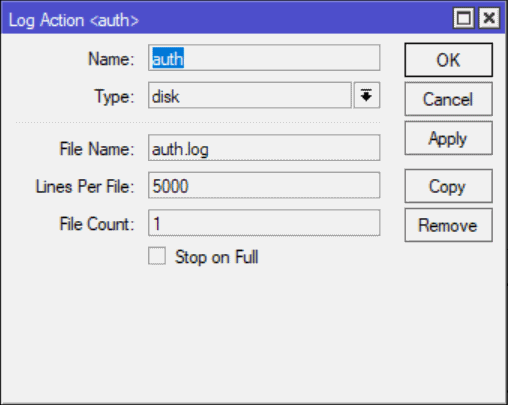 In my example the log file will retain the last 5000 entries. The second line tells the MikroTik router to write any new logs with the topic account to the auth.log file. If you are using winbox here is what the configuration screens look like. 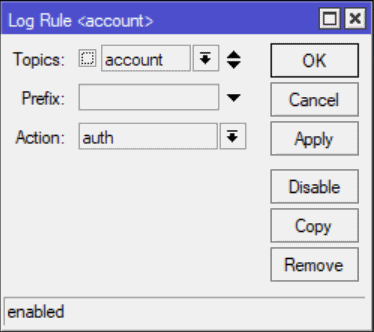 The above configuration will only log successful authentication events such as login and logout. If you would also like to log authentication failures you will also need to add another logging definition for critical. 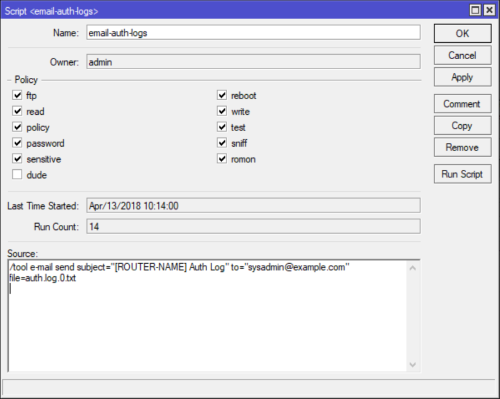 Since there are other non-authentication critical log events they may end up in your auth.log file. 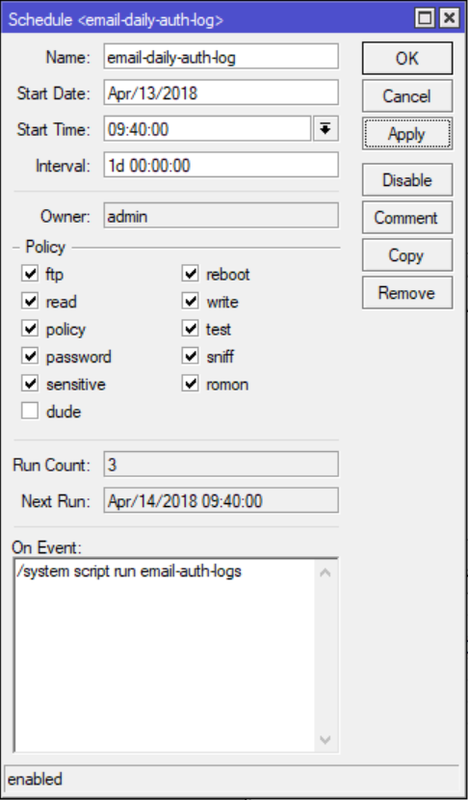 Before we get to the email configuration and script I want to point out that you can now easily filter and view authentication logs from within winbox. 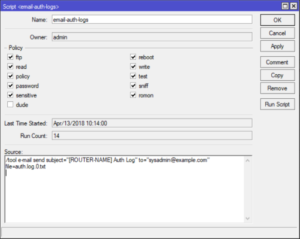 Just open the log viewer and choose auth from the dropdown. You can also print the auth log from the cli using the following command. 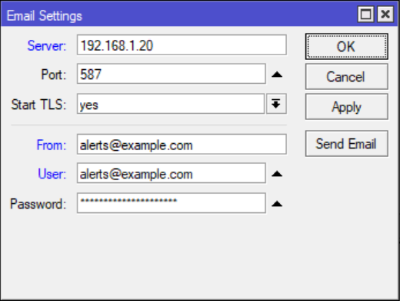 Before we can send email from the MikroTik router we must configure a valid email server in Tools | Email. Here is an example, of course you will have to workout your own authentication credentials. I have chosen to create a dedicated script and separate schedule that executes the script. I could also just paste the script right into the schedule itself. I like the separated approach because you can run the script on demand from winbox using the Run Script button. 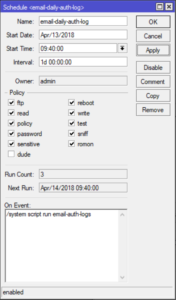 /system script add name=email-auth-logs owner=admin policy=\ ftp,reboot,read,write,policy,test,password,sniff,sensitive,romon source="/to\ ol e-mail send subject=\"[ROUTER-NAME] Auth Log\" to=\"sysadmin@example.com\ \" file=auth.log.0.txt"
The schedule that I have configured emails the auth.log file as attachment everyday at 9:40AM. Here are the equivalent winbox screenshots. 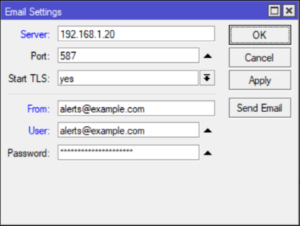 I hope you find this technique useful in monitoring and managing your MikroTik devices. Feel free to leave a comment below or checkout my other MikroTik Tutorials. 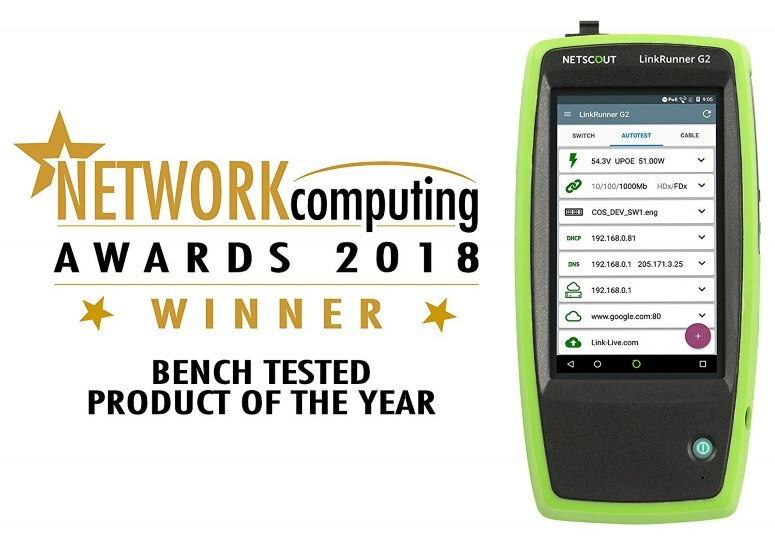 Is it possible to define it only with access by winbox? If I understand you correctly, you are wanting to filter down the list of log events to only include winbox and web logins (successful logins and login failures). The following command will query all logs for winbox and webfig authentication events and write them to a new file. Then you can augment the script to email that file instead.